In the very first episode of NEStalgia we take a look at 10-Yard Fight. 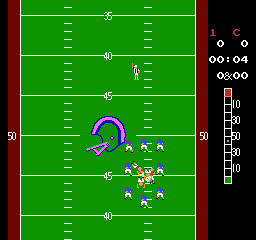 The 1983 American football arcade game that was developed and published in Japan by Irem and published in the United States by Taito. The game offers one of the simplest ways to play Football. There is no playbook, there are no challenges, there are no stats. What you see on the screen is exactly what you get, but is that fun? Personally, we felt after about four playthroughs the game exhausted everything it had to offer. That's really not saying a lot about how fun this game is, but it definitely can be fun if played with another real person. What the A.I lacks in strategy and blind luck is exactly what a real competitor can offer in terms of arcade action. The only way to play 10-Yard Fight at home is on the NES. It was only ported to other consoles in Japan and probably for sound business decisions. Buying a copy will not set you too far back, but is it worth it? As mentioned above the game is not much fun by today's standards, but on a control level it's easily playable. The controls are incredibly simple and there is very little strategy involved. If you're going to play this game we recommend multiplayer (even though the 2nd player retains the A.I cheats) over single player because of the small replay value playing alone offers. 10-Yard Fight is a great entryway into 8-bit arcade football gameplay. That's about all it's good for at this time. Is it leaps ahead of what Atari and others had labeled as "Football" in the previous generation? Absolutely? Does it offer anything that you can't find in later iterations? Not at all. The game is so simple and devoid of what makes Football the sport it is that we can't possibly say this game holds up today. THE VERDICT: 10-Yard Fight does NOT make our list of essential NES games. There is nothing this game can offer that future iterations of football games (including those on the NES) are more capable of. We would only reccomend playing this if you're already nostalgic for it.